Last Week: Nailed it again. Wow, what a nice weekend it was! Saturday there was wind along the northern half of the lakeshore and it was out of the north. I posted some pictures here. 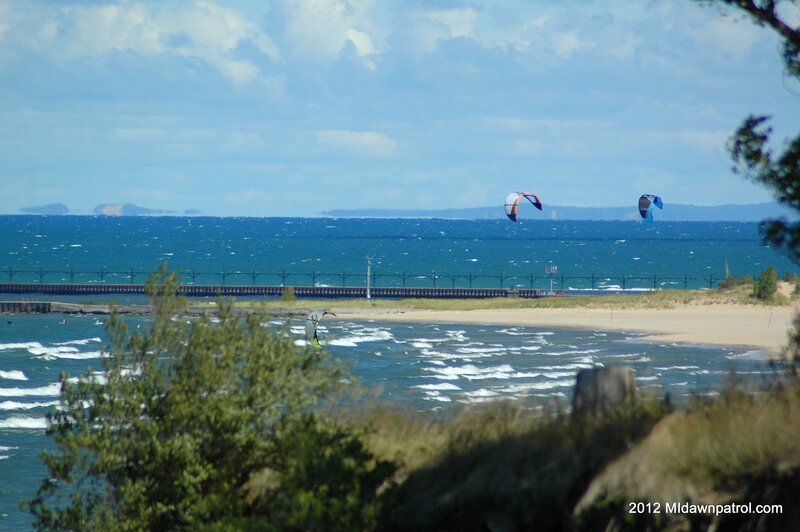 Sunday there was wind, but it stayed out of the east and didn’t allow for kiteboarding along the Lake MI shoreline here. Some kiters did get out on inland lakes. Saturday: Not looking very good for riding. The wind is going to be out of the east all day. No where on the shoreline will it be rideable. It might be possible on some inland lakes, but probably gusty with showers passing to the south during the day. Sunday: This looks like the best day. The sun should be out all day and the wind is going to be out of the North and NNW. For the northern half of the lake shore, Manistee and Little Sable Point should be good all day with winds in the 20 to 25 knot range out of the North. Further south, from Muskegon to Holland the wind is going to need to come around to NNW for it to be rideable. This should happen in the afternoon with the sun helping to pull in to side on conditions. Right now I would say it could be anywhere from 15 knots to 25 knots, NNW from mid to late afternoon. Further south of Holland, it should be good wind out of the North.